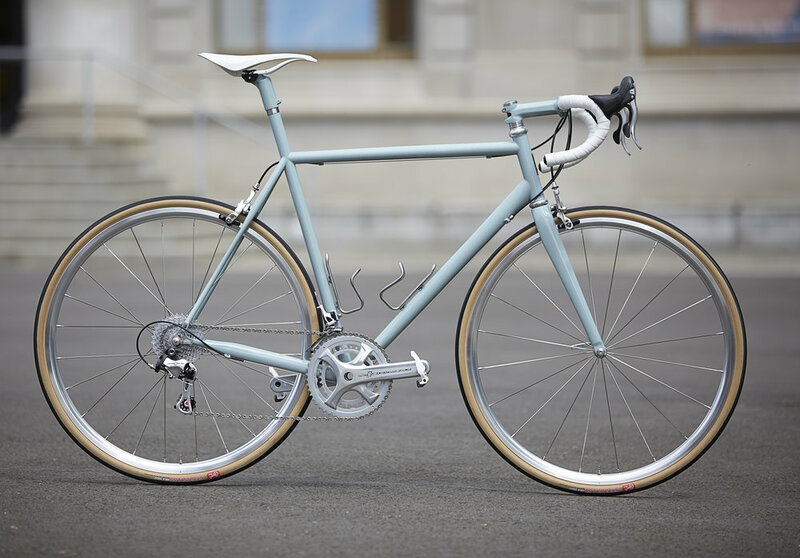 The tale of this bike build is a stange one. You see, I had no real plans to build up a Speedvagen so quickly when I first arrived here. I had recently completed a new bike build and thought my stable was set. I was leaning heavily towards wanting an Urban Racer as my first SV, a bike that I had nothing else like. One of the first projects our design team worked on after I was hired was the 2017 color palette. A family of colors that worked so well together, we eventual painted a full size run in each color. One color absolutely had my attention at an emotional level, perhaps that's me being a design dork, but I like to think this can happen to everyone. Much like how smell is the strongest sense tied to memory, color, I feel is tied to emotion. You can see a color and it can instantly remind you of a place you have been, a particular day, or of a friend. It can be as complicated as viewing a Rothko, or as simple as seeing the color of your first bicycle in an unexpected place. It makes you feel something, sometimes you can't explain it other times you know that exact reference point. My frame started life here at The Vanilla Workshop ready to be the next 58cm OG1 ordered. Primed for either Citron or Matte Army paint, and to be shipped out the door within 2- 3 weeks. Ready Made and Custom frames waiting for finishing and paint. 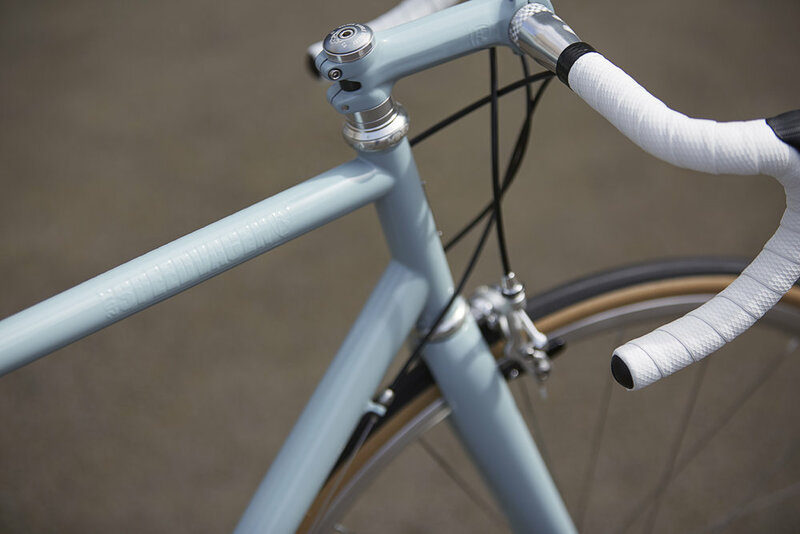 Side note: A sort of misconception I have heard from people is they think the Speedvagen OG1 frame is in someway built differently than our custom Speedvagen frames. This isn't true. 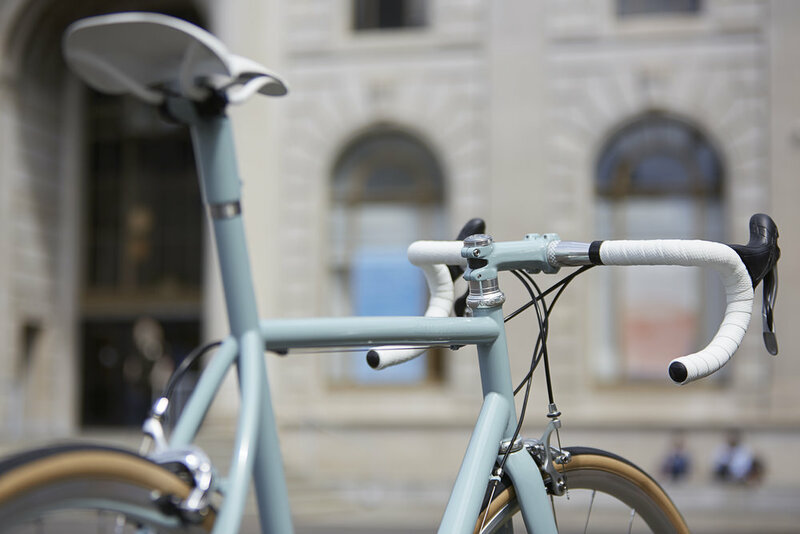 Its the same tubing and all of the same little functional and aesthetic details that make an SV what it is, all built to match the look and ride of custom. 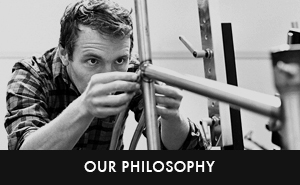 This includes work from our own paint wizards and the pro mechanics who build up all of our bikes. Here's the difference: Our OG1 frames are built in standard sized and colors, rather than custom, which follow more of a one-at-a-time process. Because of this, we can batch the work and save a bunch of time. Because we're saving time from efficiency, we sell the OG's for less. Bada-Bing! 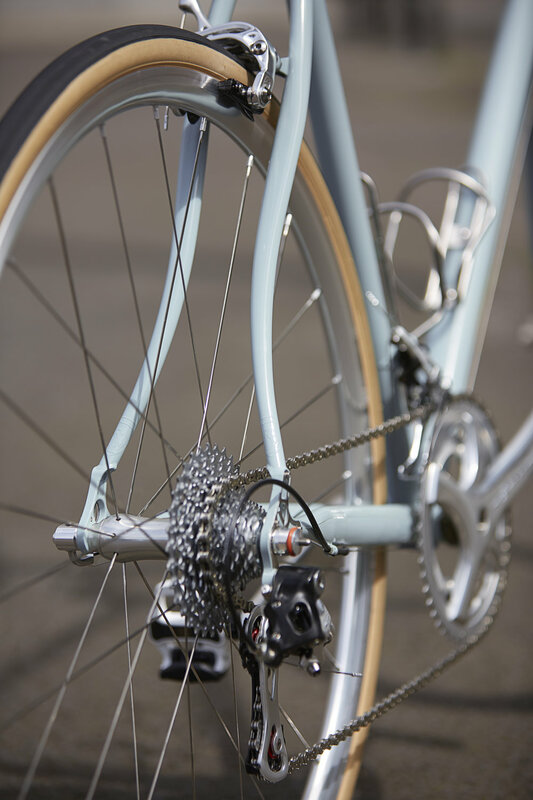 Now, of course we feel strongly about custom and the beautiful ride that can be had from a rider's weight being distributed just right across the contact points and then onto the wheels. But we love our bikes and we want them to be available both as super over-the-top custom with tons of bling and also as a bare bones every day, all the time race machine; a Speedvagen (built start to finish in the US) that is price competitive with the big box, off the shelf bikes. Fast forward about two months, there we were planning 2017 guidebook. We snagged a size run of frames, painted them in our 2017 colors, and built them all up with the exact same parts; Dura Ace 9100, Enve rims and DT Swiss 240 hubs painted to match. After guidebook each bike would be rebuilt with OG1 parts and then become one of our demo bikes for our Fitting Tours. Luckily for me, my favorite color made it onto the size 58 frame. This is all it took to plant the seed of a build. A seed that grew rapidly out of control and turned into a full on build plan in the matter of a few days. From the second I saw our 2017 Slate blue on a bike, it grabbed me. It was classic in a way not seen on many bikes, a subdued hue where most companies go full saturation. Paired with our Ghost graphics it celebrated the form of the bike, it was minimal and clean. If you know me and my design aesthetic, this is pretty opposite to who I am and my previous bike builds. I love visual noise and perhaps it was this simplicity that drew me in more. Slate blurs the lines between grey and blue, to me it is the color of late winter rides in Kansas. The color of those days when there isn't a could in the sky, the temperature just creeps into the low sixties, and you can spend the entire day on the bike. The long prairie grass is a golden brown-red-yellow during this time, this is my favorite color in the world. Slate just so happens to be the the literal color compliment to that golden grass color. Its the first thing I thought of when seeing it. I was instantly transported back to riding the endless country gravel just south of our home. Like I said, it's oddly emotional for me. photo by Andy White Konza Prairie south of Manhattan, KS. After seeing all of the guidebook bikes built up, it was right then when I realized that Slate was begging for an all silver build kit, a modern classic was the idea. 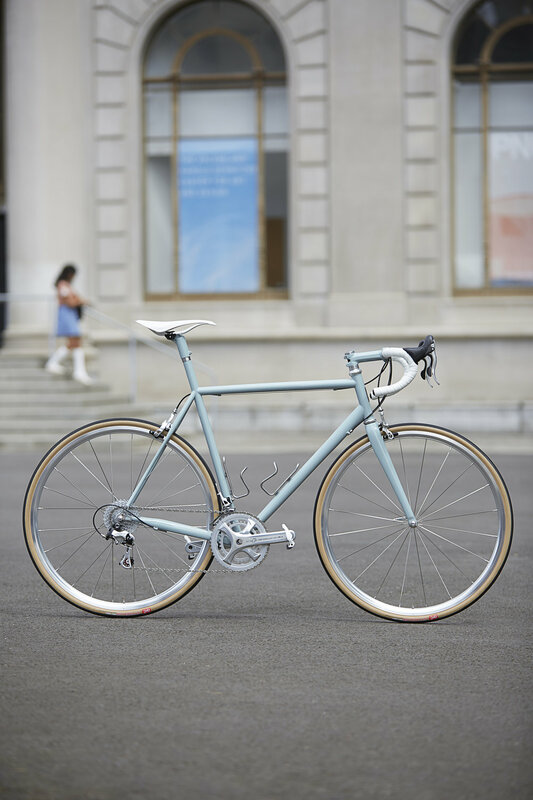 A bike that would have all the benefits of custom steel frame and parts, yet look as classic as possible. Timeless was the goal, if not a bit "retro." The Slate frame would balance out the gum wall tires as that grey-blue sky balances out the golden Kansas winter prairie. Yeah... this is how dorky I get about bike builds, and there's about to be a lot more of this below (here's your warning and oppertunity to skip straight to the pictures.) When I plan a build every part and choice has a reasoning and I try to not forget a single detail or viewpoint. After the guidebook photo shoot, I approached Sacha about the possibility of buying this bike, and explained my idea of building it up as a modern classic. He was into it and cut me a killer deal since I work here. As this idea was quickly becoming a reality, I realized that the all polished silver wheels and a groupset would be the key. No one was making what I wanted for wheels and I was out of options. I reached out my friends at Industry 9. Even though they didn't offer an all silver wheel set, the idea of a vintage Campagnolo Shamal Ti Rim wouldn't escape my mind. I asked them what we could do, as they are known for their custom wheel build options. They ended up stripping the anodization off a set of rims and hand polish them to the glass like mirror finish. Exactly the look I was aiming for, with the modern benefits of a tubeless rim. I9 wheels are a personal favorite of mine, having owned another set of I25 TL's I knew the ride quality and weight were spot on for what I needed. They are a 1450g wheelset with killer engagement that snaps your pedaling power instantly into forward motion. Up next was the all silver components. There was one option, Campagnolo Potenza. Campy's newest group, Potenza is marketed as a competitor to Ultegra and it seemed like all the performance I needed. My focus on this bike was more of an all day ride rather than a pure crit machine. The bonus to using this group is it features Campy's first 32 tooth cassette. Paired with a 50-34 chainring it would ensure my "Kansas legs" would have the range they need for the Portland hills. The fit is still that signature Sacha White aggressive fit, but the plump tires, and wider gearing really help ease the fatigue on a long ride. I would compliment the silver parts with a very limited all white Fabric ALM and their silicone bar tape. 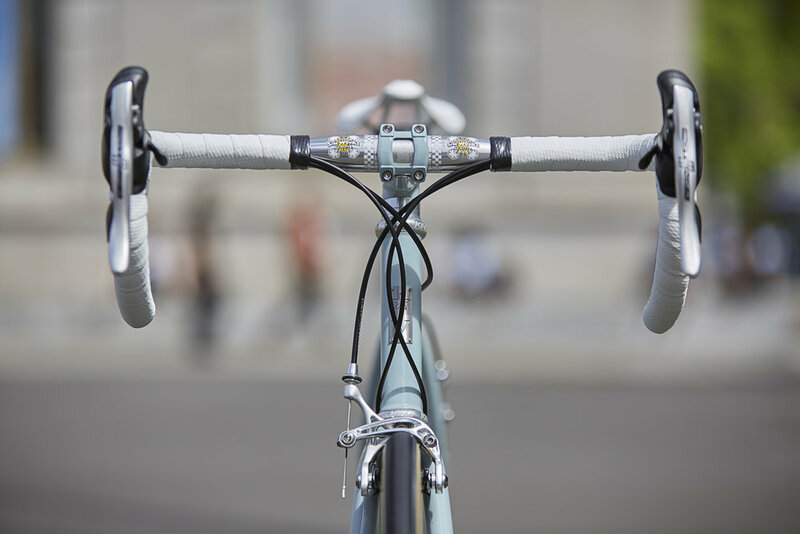 I used the ALM with white rails to mimic the feel of a mid-to-late 80s white Selle Italia Turbo or Selle San Marco Regel saddles, and the boom of white being introduced on pro tours and high level production bikes. The Turbo's top cover wrapped all the way down the side almost hiding the rails, a design long gone from modern saddles where exposed rails are now the norm. I was trying to re-create this vibe in modern components. Other details on this build are ceramic Not for IG Pulleys by Kogel, they lower drivetrain friction which is basically free watts bro! Alloy pulleys have a certain "ting" when you shift that I have grown to enjoy. King Ti cages are ultra light made in the USA bottle cages and are an absolute shop favorite. A silver Chris King headset was spec'd for simply one reason, they are the best American made headsets available. When you have gone this far in planning a build it's not hard to take it to 11. To take to do so meant reaching out to another industry friend. This time it was Paul Components, for custom high polished skewers. No, it wasn't just for color, Paul skewers are my favorite. How do you have a favorite skewer you ask? Well, I actually have two reasons. First and foremost they work flawlessly, super quick and easy, as it should be, and they don't wear out over time like other skewers with plastic caps or parts. 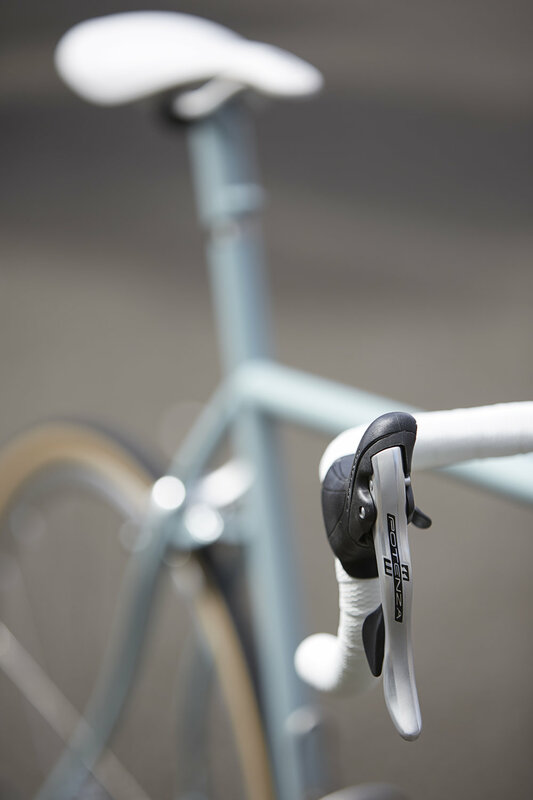 Secondly the "L" shape of the lever is similarly shaped to old Campagnolo skewers which again fit the build perfectly. One thing that I have learned from Sacha, and what I firmly believe is a part of his "bike ideology" is really thinking about what makes an experience better? What objects or products really change your world when you use them? 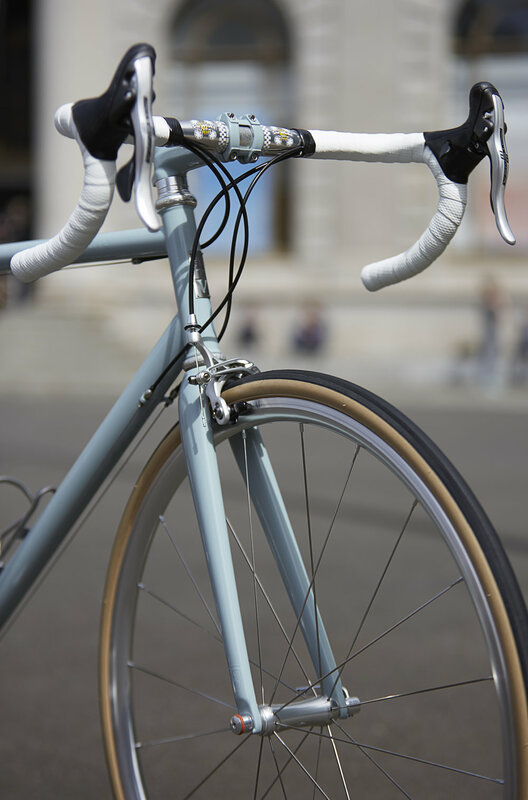 You don't use skewers daily, or even monthly, but when you have a flat and changing it is quick and easy and the skewer lever actually makes you happy to use it, it changes the entire way having a flat effects your ride. Bikes don't always have to be about going fast, pause and take the time to experience the craftsmanship and care that went into such a small part of a bicycle, I promise it will make your day better. The last details left were bars and pedals. Sim-Works 45 cm Wonderer bars, wide with compact drops, they are modern and comfortable. These bars are made by Nitto, the Japanese power house of all things stem and bar related. The build was finished off with white iSSi carbon road pedals. 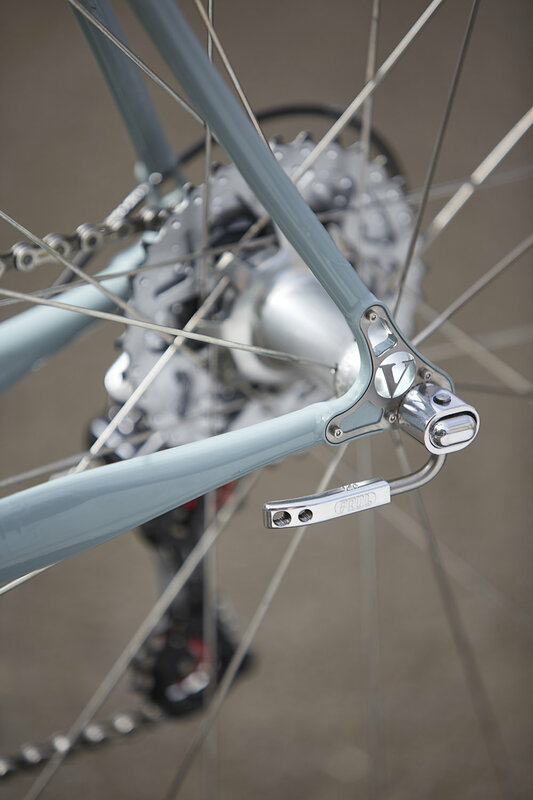 They are 3-bolt Look cleat compatible, light weight and completed the white triangulation I needed from saddle-to-bar-to-crank, keeping the viewers eye moving around the aesthetics of the bike, not just looking onto the bright spots. Thats the build, a condensed list and full photo gallery is below, shot by Bob Huff. I hope offering some insight (probably way too much) about the thinking behind this build, will help you plan out your own Speedvagen build. If you have any questions drop us an email at info@speedvagen.com and we, (or even I) can personally help you plan a build. Want something very similar? We're working on it! A classic, all silver complete or build kit might be in the near future. Cant wait? Drop us an email and we might be able to sneak you some details. 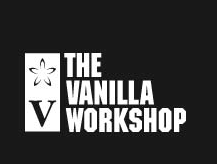 Posted on May 17, 2017 by The Vanilla Workshop.